Happy Tuesday! I hope you’ve had a great week. I’m excited because I have a number of videos for our friends who celebrate Hanukkah! At Chez Stone, we celebrate both Hanukkah Hanukkah and Christmas, so I am feeling VERY festive right now writing to you with my Menorah at my right and our Christmas tree to my left. :). 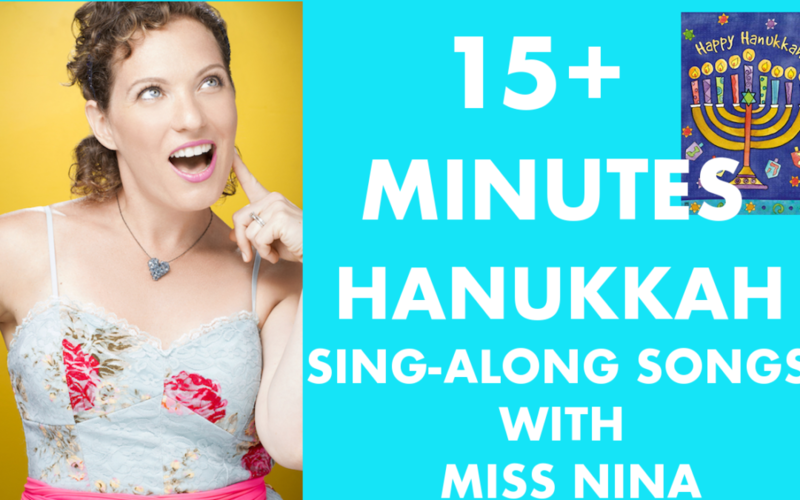 For my entire professional “Miss Nina” life, when it has come to holiday time I’ve always had a slew of Christmas songs and Winter songs, but typically just two Hanukkah songs – I Have A Little Dreidel and Hanukkah, O Hanukkah. There’s definitely more, but none that were very well known or particularly catchy. And then in my last couple of years living in New Jersey, I had the great fortune of becoming the early childhood music teacher for the JCC preschool in my area. And I became familiar with SO MANY MORE!! So today I have LOTSA VIDEOS!! I’ve added I’m A Little Latke & Who Fought Antiochus to the Hanukkah repertoire in single videos, and then I’ve also made this 15+ minute video compilation of all of my Hanukkah sing-along songs! Sung to the tune of I’m A Little Teapot, this one is just a simple little song about being a potato Latke and being eaten on Hanukkah night. Not particularly deep or at all religious – lol! I’m a Little Latke round and flat. Here is my front side Here is my back. When I am all ready take a bite. Eat me up on Hanukkah night! And second I’ve got, Who Fought Antiochus. This one, a call and response song, is simple and fun and a little bit more informative/historical. This drives home the name of the Maccabee’s for kids and emphasizes that the Macabees fought Antiochus, saved the Temple and “gave us Hanukkah”. I know, I know the Maccabees! So there you have it! So many Hanukkah songs to have fun with this week during the Festival of Lights! I’ll be back in your inbox next Tuesday with a Christmas Song Compilation video and plus at least one new single video, too. Woohoo! I am IN the holiday spirit!! Enjoy the videos and you’re week. And if you celebrate, I wish you a very Happy Hanukkah! I’ll see you in your inbox next Tuesday!